Coates is a trusted US based producer of pool and spa heaters since the 1940s. Since then, it has made a name for itself for producing high quality reliable water heaters. Its pool and spa heaters are electric and range from 1.5 kilowatts to 300 kilowatts. Their smaller heaters are perfect for residential applications while its heaters in the 180 kW to 300 kW range can be used for a number of commercial purposes. The following is a list of the Coates series of water heaters, their size and the recommended use. Be sure to read our reviews for more detail. We offer the best online price for Coates pool heaters which is generally 20% to 30% cheaper than your local store. ILS Series ranges from 1.5 kW to 5.5 kW and is best for small spas holding less than 400 gallons. ST Series ranges from 5.5 kW to 11 kW and is best for small spas holding between 250 and 600 gallons. CE series ranges from 12 kW to 18 kW and can be used for large residential spas or small pools. CPH Series ranges from 24 kW to 30 kW and can be used for the majority of residential pools. PHS Series ranges from 36 kW to 57 kW and is recommended for large pools and those operating in cold weather conditions. PHS-CN Series ranges from 18 kW to 57 kW and is recommend for salt water pools because it features corrosion resistance technology. 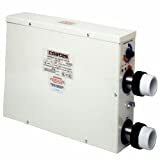 PHS-20 Series ranges from 180 kW to 300 kW and is recommended for commercial sized pools.